Any fisherman will tell you that choosing one spinnerbait out of all the options in your tackle box relies heavily on numerous factors. Light conditions, water clarity, and even the time of year are all variables to consider when deciding which one to throw. Conventionally, an angler will choose a dark color with Colorado blades to create a lot of vibration when it's cloudy or when the water is stained and murky, compared to a bright day or clear water, when most will opt for a bright colored lure with the flash of willow-leaf blades to catch the light. Still, even though this system does work, there are situations when the fish ignore tradition and won't strike any spinnerbait you put in the water, no matter the color, blade, or retrieval speed. Challenges such as this are what separate those who think outside the box from those who simply chalk it up to getting skunked and call it a day. There is, however, a simple solution to feeling limited with your own selection of spinnerbaits, as well as the selections found at tackle retailers: use what you already have to customize your own. The process is actually quite easy, and the best part is, you already have everything you need sitting in your tackle box. All you'll need are any spinnerbaits you have on hand and some fishing line (preferably braided, but if you can tie a good knot, any line will do). If you feel the need to interchange your blades, as well, you'll need a par of needle-nose pliers, too. 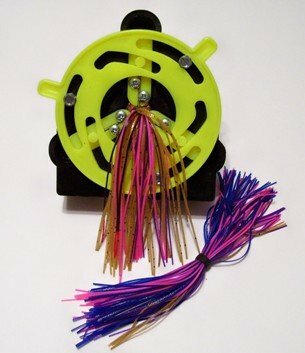 First, to remove the skirts from your spinnerbaits, take off the collar and separate each of the colors. Then you'll need to pick which colors you want to use and group them, length-wise, with each other. Here is where you can truly let your creativity shine, as you can literally choose whatever combination of colors you want to put in a new skirt. Finally, bunch them at the appropriate spot on the spinnerbait jig, with about a quarter of the length closest to the hook, and tie your line tightly around the skirt a few times and fasten it with a strong knot. That's how easy it is. You can do this before your trip or even on the boat during a quick break. You may be thinking that this setup won't run as true as a store-bought lure, or the fishing line will snap and you'll lose your skirt on the first cast, but I can tell you from experience, you'll be fine. On a recent fishing trip, a buddy of mine and I both decided to combine the yellow and black skirts from two different spinnerbaits. We each had one new lure that resembled a bumblebee and decided that it would be the only lure we used in the morning. Needless to say, the next day would be one I'll never forget; he and I caught the only fish out of everyone in the boat. In fact, in the span of an hour or so, we pulled in over twenty keepers between the two of us. Nearly every other cast, a fish was caught and it quickly became more of a contest for him and me, to see who could catch more before we headed in for lunch. He and I still can't believe just how effective our home-made customized lures worked. The best part about the day was the knowledge that he and I took the time and creativity to rig up colors we hadn't seen in stores and it allowed us to catch a ton of fish in a short period of time. Using what you already have in your tackle box can seem like an impractical undertaking to some, as most won't enjoy removing skirts from perfectly good spinnerbaits. You don't have to treat your own spinnerbaits like Frankenstein's monster, however. 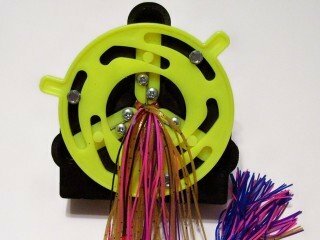 There are several companies that sell individual components for making your own spinnerbaits, including jig heads, skirt material in a variety of colors, and blades of all shapes and sizes. There are even tools, such as Naked Bait's Skirt Expander, which make the process even easier by allowing you to professionally collar your skirts to the bait. If you're interested in possibly creating your own spinnerbaits, feel free to visit websites for companies such as Tackle Warehouse and Jann's Netcraft, where you'll find everything you'll need. Believe me when I say that the process of customizing your spinnerbaits is not hard or time-consuming in any way. You can use what you already have in your tackle box, or ambitious anglers who yearn to create an arsenal of their own creations will discover countless options by checking out any number of websites or catalogs that offer components to do so. Either way, you will be limited only by your own imagination. I urge anyone who has ever wanted a color combination they couldn't find in stores to take the time and try to customize it on their own. From, experience, I can guarantee the first fish caught with it will give you more pride than any lure you can buy at a retailer.